Minsk ( Français: Minsk, Spanish: Minsk, Deutsch: Minsk, Русский: Минск) - (The) city in Belarus, situated in Minskaya Voblasts’ region. According to the latest census, the city population is 1742124. Geographical coordinates of Minsk (WGS84): latitude: 53° 54' 0" N ( 53.9 ), longitude: 27° 34' 0" E ( 27.5667 ). Useful information about Minsk from Gulliway. We recommend you to visit the following pages about travelling to Minsk: Interactive map of Minsk. The most popular sights and events are: Minsk Metro, Dinamo Stadium (Minsk), State Security Agency of the Republic of Belarus, Musée national des beaux-arts de Biélorussie . 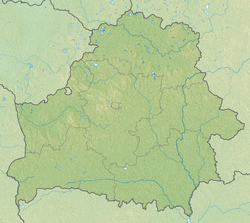 Wikipedia about Minsk: Minsk on our wiki pages. Minsk (Belarusian: Мінск, pronounced [mʲinsk]; Russian: Минск, [mʲinsk]) is the capital and largest city of Belarus, situated on the Svislach and the Nyamiha Rivers. As the national capital, Minsk has a special administrative status in Belarus and is the administrative centre of Minsk Region (voblast) and Minsk raion (district). In 2013, it had a population of 2,002,600. Minsk is the administrative capital of the Commonwealth of Independent States (CIS) and seat of the Executive Secretary. Minsk has a warm summer humid continental climate (Köppen Dfb ), owing to its location between the strong influence of the moist air of the Atlantic Ocean and the dry air of the Eurasian landmass. Its weather is unstable and tends to change often. The average January temperature is −4.5 °C (23.9 °F), while the average July temperature is 18.5 °C (65.3 °F). The lowest temperature was recorded on 17 January 1940, at −40 °C (−40 °F) and the warmest on 29 July 1936 at 35 °C (95 °F), and on 3 August 2014 at 35 °C (95 °F). This results in frequent fogs, common in the autumn and spring. Minsk receives annual precipitation of 690 millimetres (27 in), of which one third falls during the cold period (as snow and rain) and two thirds in the warm period. Throughout the year, most winds are westerly and northwesterly, bringing cool and moist air from the Atlantic. Similar climatic regimes are found in Stockholm, Sweden and in Halifax, Canada. After the Second World War, Minsk was rebuilt, but not reconstructed. The historical centre was replaced in the 1940s and 1950s by Stalinist architecture, which favoured grand buildings, broad avenues and wide squares. Subsequently, the city grew rapidly as a result of massive industrialisation. 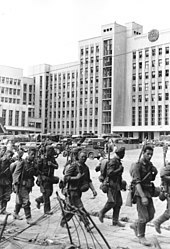 Since the 1960s Minsk's population has also grown apace, reaching 1 million in 1972 and 1.5 million in 1986.Construction of Minsk Metro began on 16 June 1977, and the system was opened to the public on 30 June 1984, becoming the ninth metro system in the Soviet Union.The rapid population growth was primarily driven by mass migration of young, unskilled workers from rural areas of Belarus, as well as by migration of skilled workers from other parts of the Soviet Union. To house the expanding population, Minsk spread beyond its historical boundaries. Its surrounding villages were absorbed and rebuilt as mikroraions, districts of high-density apartment housing. The Old East Slavic name of the town was Мѣньскъ (i.e. Měnsk < Early Proto-Slavic or Late Indo-European Mēnĭskŭ), derived from a river name Měn (< Mēnŭ). The direct continuation of this name in Belarusian is Miensk (pronounced [mʲɛnsk]).The resulting form of the name, Minsk (spelled either Минскъ or Мѣнскъ), was taken over both in Russian (modern spelling: Минск) and Polish (Mińsk), and under the influence especially of Russian it also became official in Belarusian. However, some Belarusian-speakers continue to use Miensk (spelled Менск) as their preferred name for the city. There are no reliable statistics on the religious affiliations of those living in Minsk, or among the population of Belarus generally. 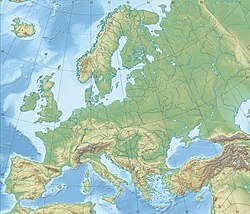 The majority of Christians belong to the Belarusian Orthodox Church, which is the exarchate of the Russian Orthodox Church in Belarus. There is a significant minority (approximately 20 percent) of Roman Catholics. Currently, there are approximately 30 churches of various denominations in Minsk. In 2012, Gross Regional Product of Minsk was formed mainly by industry (26.4%), wholesale (19.9%), transportation and communications (12.3%), retail (8.6%) and construction (5.8%). GRP of Minsk measured in rubles was nearly 120×10 (trillions or millions of millions; BYR 120 trillion ≈ USD 12.76 billion), or 23.7% of Gross domestic product of Belarus. Official statistics quote unemployment in Minsk at 0.3%. During 2009 census 5.6% of Minsk residents of employable age called themselves unemployed.The government discourages official unemployment registration with tiny unemployment benefits (70 000 BYR ≈ $7 per month) and obligatory public works. As of 2013 Minsk metro had 28 stations and 35.5 kilometres (22 miles) of tracks. Trains use 243 standard Russian metro-cars. On a typical day Minsk metro is used by 800,000 passengers. In 2007 ridership of Minsk metro was 262.1 million passengers,making it the 5th busiest metro network in the former USSR (behind Moscow, St. Petersburg, Kiev and Kharkiv). During peak hours trains run each 2–2.5 minutes. The metro network employs 3,200 staff. Minsk is the largest transport hub in Belarus. Minsk is located at the junction of the Warsaw-Moscow railway (built in 1871) running from the southwest to the northeast of the city and the Liepaja-Romny railway (built in 1873) running from the northwest to the south. The first railway connects Russia with Poland and Germany; the second connects Ukraine with Lithuania and Latvia. They cross at the Minsk-Passazhyrski railway station, the main railway station of Minsk. The station was built in 1873 as Vilenski vakzal. The initial wooden building was demolished in 1890 and rebuilt in stone. During World War II the Minsk railway station was completely destroyed. It was rebuilt in 1945 and 1946 and served until 1991. The new building of the Minsk-Passazhyrski railway station was built during 1991–2002. Its construction was delayed due to financial difficulties; now, however, Minsk boasts one of the most modern and up-to-date railway stations in the CIS. There are plans to move all suburban rail traffic from Minsk-Passazhyrski to the smaller stations, Minsk-Uskhodni (East), Minsk-Paudnyovy (South) and Minsk-Paunochny (North), by 2020. Minsk hosted the 2014 IIHF World Championship. Lee Harvey Oswald, alleged assassin of US President John F Kennedy, resided in Minsk from January 1960 to June 1962.